Myrle J. Lehman, 85, of Rock Rd., Pine Grove, passed away on Saturday, December 1, 2018 in the Tremont Health & Rehab Center. Born on March 12, 1933 in Pine Grove, she was a daughter of the late Samuel F. Sr. and Ruth G. Miller Kramer. She was a graduate of Pine Grove High School and a member of St. Peter's UCC, Pine Grove where she was a member of consistory and choir and she also cleaned the church with her sister Ruth. Myrle worked at Blinkers Tropical Treat, was a button holer at C & W. Manufacturing in Pine Grove and worked in the shipping dept. at Summit Station Mfg, Pine Grove. 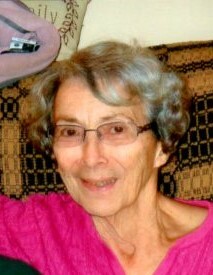 She loved her family and enjoyed going on walks and hikes with her husband and watching her grandchildren play sports. She bowled in a league at Pine Lanes and enjoyed playing pinochle with her card club. Preceding her in death were her husband of 63 years, Eugene R. "Bob" Lehman on Oct. 24, 2018; two brothers, Samuel Kramer, Jr. and Frank Kramer; two sisters, Ruth Schwartz and June Doody. Surviving are two sons, Eugene "Bob" Jr. and wife Cynthia Lehman, Keith and wife Denise Lehman; daughter, Lisa and husband Frank D'Agostino, Jr., all of Pine Grove; 8 grandchildren, Tara and husband Chris Whitsel, Melissa and husband Ryan Erdman, Eugene "Bobby" III and wife Judy Lehman, Jared Lehman and fiancé Mallory Kohn, Jordan Lehman and fiancé Devon Utterback, Erika D'Agostino, Frank D'Agostino, III, Koby D'Agostino; 12 great grandchildren, Isabella, Carter, Mason, Owen, Elijah, Zoey, Gideon, Grace, Gabriel, Amara, Logan and Gianna; nieces and nephews. All Services will be held at the convenience of the family with Pastor Jason Stump officiating. Interment will follow in St. Peter's Lutheran Cemetery, Pine Grove. In lieu of flowers, the family would prefer contributions be made to St. Peter's UCC, 277 S. Tulpehocken St., Pine Grove, Pa. 17963 in her memory.